Tekle Negash’s days of riding a battered minibus to work in Ethiopia’s capital are over. 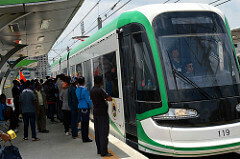 Boarding Addis Ababa’s $475-million, Chinese-built and funded Light Rail, he can slash his one-hour commute by two-thirds and still save money. The 50-year-old trader was one of thousands who queued Sunday for the opening of the first phase of the state-owned urban railway, which comprises 34 kilometers (21.1 miles) of lines across the city. In a ceremony that featured a Chinese delegate’s impromptu singing and an Ethiopian dance troupe, Transport Minister Workneh Gebeyu described the project, one of the first of its kind in sub-Saharan Africa, as a milestone in the nation’s journey out of poverty. The Light Rail is the first in a raft of Chinese-funded infrastructure projects that Ethiopia’s government says will come online in the next few months and help maintain annual economic growth of more than 10 percent. Another railway along the main trade route to neighboring Djibouti may begin early in 2016, while the Gibe III hydropower dam’s reservoir has started filling, with its 1,870 megawatts capable of almost doubling Ethiopia’s generating capacity. The operational track, which includes elevated sections and tunnels, runs from Addis Ababa’s main industrial area on its southern fringe, through the trading district of Merkato to the historic center of Piazza. An east-west line skirts the African Union’s headquarters, soars past the main government district and out to modern housing developments. The Ethiopian Railways Corp. service, which will be run and maintained by Shenzhen Metro Group and China Railway Engineering Corp. for five years, may eventually carry 60,000 passengers an hour, according to project manager Behailu Sintayehu. The second line will start running when China Electric Power Equipment Technology Co., another state-owned company, finishes connecting it to a dedicated electricity supply, he said in a text message on Monday. A ticket for the 17-kilometer journey across the city of at least 3.24 million people is priced at 6 Ethiopian birr ($0.29), and the line will cost about 1.5 billion birr a year to run, Workneh said. “The government is subsidizing this transportation system, this is not for commercial purpose, it’s for the public,” he said. The government agreed to borrow the funds in June 2011 from the Export-Import Bank of China at the 6-month Libor interest rate plus 2.6 percent and a grace period of three years, according to Ethiopian Finance Ministry data. State-owned contractor China Railway Engineering Corp. was the recipient of the export financing and completed construction in less than two years. The loan, which is part of Ethiopia’s growing total public debt of around 60 percent of gross domestic product, will be paid back partly by profitable rail projects, Workneh said.